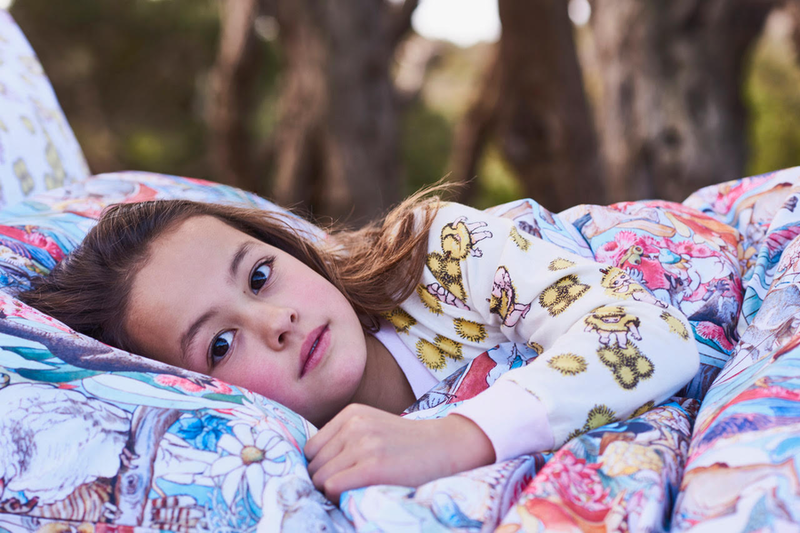 Merchantwise’s May Gibbs has yet again partnered with celebrated lifestyle brand, Kip&Co for a brand-new collection of bedding, adult, children’s and baby apparel celebrating the very best of May Gibbs’ Australian flora, fauna and magical little creatures. The range which has just hit retail is the fourth collaboration between the two brands, first launching in October 2016. Following this sold-out range, the May Gibbs brand partnered with Kip&Co in January and July 2018, again with sold-out success. This new collection revisits a couple of our favourite original collaboration prints plus a few new ones filled with May Gibbs’ magical little creatures and beautiful Australian flora, fauna and wonders from under the sea! This collection also includes the irresistible addition of little leggings for kids, and a PJ onesie. As always, a collection to hand down to the next generation. “We are extremely pleased to be partnering again with Kip&Co on a must-have May Gibbs collection. Yet again, Kip&Co has brought May Gibbs’ much treasured inherently Australian illustrations to life with this beautiful bedding and apparel collection. If the past ranges are anything to go by, this new collection will be a sell-out success,” said Merchantwise’s May Gibbs Brand Manager, Rosalie May. “Back by popular demand, we are thrilled to be launching our fourth collaboration with the May Gibbs brand. Our Kip&Co fanbase absolutely adores May Gibbs’ beautiful illustrations and the success of past collaborations is indicative of the demand for this brand-new range. We are sure it will more than please both May Gibbs and Kip&Co fans,” said Kip&Co’s Co-Founder, Kate Heppell. Born in 1877 in Kent, United Kingdom, May arrived in Australia at the age of four. She drew and painted as a child and went on to study art in Western Australia and in the UK before settling in Sydney as a children’s books author and illustrator. On her passing in 1969 she bequeathed 50% of the copyright of all her works to The Northcott Society and 50% to Cerebral Palsy Alliance. Through her foresight and generosity, proceeds from the sale of May Gibbs products have supported thousands of Australian children with disability and their families.